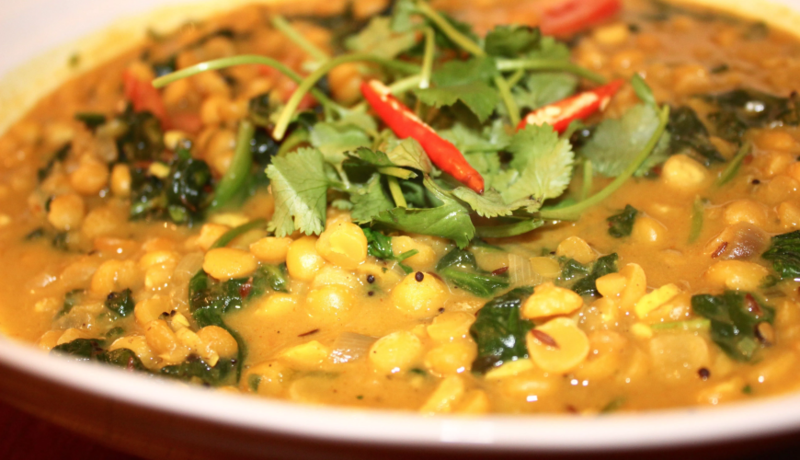 This is a simple to prepare, vegan, tasty & cost effective dish for everyone to enjoy. 1. Gently fry the onion and garlic in 1 tbsp. coconut oil for 10-15 minutes until it gently softens & browns. 2. Stir in the turmeric, chilli powder and split peas and stir for a couple of minutes. Add a dash of the stock if it begins to burn. 3. Add the remaining vegetable stock and bring to a boil. Cook for 30-40 minutes or until the split peas are just cooked through. 4. Heat 1 tbsp. coconut oil in a separate pan and fry the mustard and cumin seeds being careful not to burn. Add the contents of the pan to the split peas and combine. 5. Add the spinach & cook for 2 minutes. 6. Add the coconut milk & garam masala and cook for a further 2 minutes. The yellow split peas are an energizing complex carbohydrate offering plenty of fibre & B vitamins. They are rich in amino acid tryptophan, which is needed to support the neurotransmitter serotonin which regulates mood, appetite, hunger & sleep. Spinach is packed with phyto-nutrients, & is low in calories & high in vitamin C .
Shallots have a better nutritional profile than onions, & they are also a rich source of flavonoid anti-oxidants such as quercetin. They have a good concentration of vitamin A, which is a powerful antioxidant, & benefit you from minerals such as iron, calcium, copper, phosphorus & potassium. Garlic is a fantastic anti-oxidant & excellent source of B6 & manganese, selenium & vitamin C.
Additionally garlic is a good source of minerals such as iron, copper, calcium, & phosphorus. Coconut oil, is anti-fungal anti-microbial is not readily stored as fat because it is processed by the liver, which means it is immediately converted to energy instead of being stored as fat. Coconut oil is high in natural saturated fat, which not only increases the healthy cholesterol but also aids the conversion of the bad to the good cholesterol. This helps promote good heart health & reduces the risk of heart disease. Kashmiri chilli powder was used because it is milder in flavour than normal chillies. It benefits from a host of key vitamins such as A, B & C, while supplying a dose of quality anti-oxidants. It also offers minerals that include iron, potassium, manganese, & magnesium. Mustard seeds are a great source of protein, calcium, vitamins A & E, omega 3 & 6 fatty acids. Cumin seeds have similar benefits but are also known for their ancient medicinal properties & are an excellent source of iron too. This is such a great protein rich & healthy vegan dish that is cost effective & simple to prepare.